Retail $21.99 SAVE 24% ! 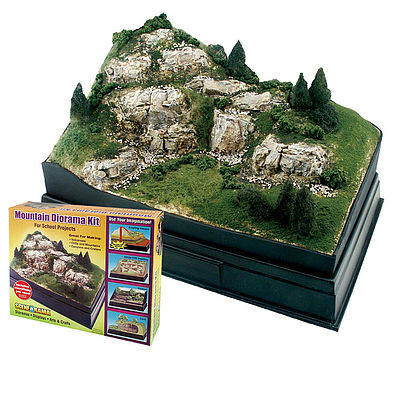 This kit provides you with supplies and material needed to create a mountainous landscaped scene! Make realistic hills, volcanoes, mountains, and simple land contours. This kit offers everything you need to get great results for building small to medium size dioramas. There&apos;s ample material for building a small mountain and grassy scene for scale model backdrops or anything else. I was surprised how easy it was to work with the plaster cloth supplied in the kit and how versatile it is to achieve any kind of layout. The variety of grasses also help create depth and visual interest. While the Scene-A-Rama product line of Woodland Scenics focuses on school projects and classroom applications, the materials will be useful for lots of applications and modelers of all ages.